It seems unlikely that one can make a circuit of 5.3 miles among trees and brush in Greenbelt, just off I-495, the Washington Beltway. Yet here, in Greenbelt Regional Park, Karen and I found this preserved spot of nature. The goldenrod-blazed Perimeter Trail makes its way, for the most part, within earshot of the freeway, among tall trees and adjacent to Still Creek and Deep Creek, which the trail crosses at several places by being carried above the eroded landscape on wooden bridges. We had walked half a mile before I became aware of birdsong, so distracting was the steady roar coming from I-495. After the first couple of miles, however, the trail moves sufficiently far from the freeway to allow one to hear the sounds of insect life. 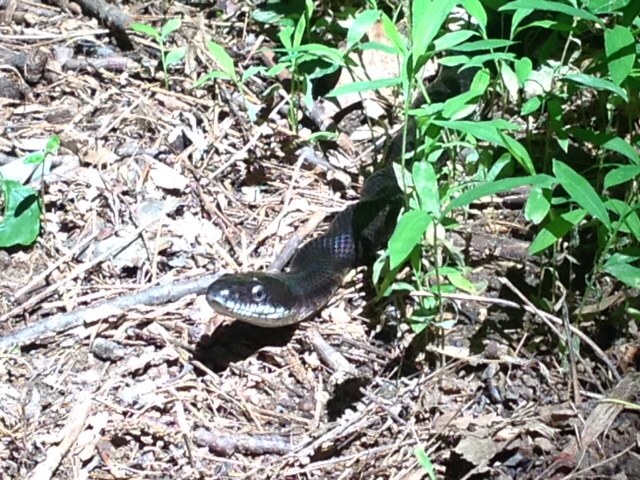 We did not hear the snake that cautiously emerged onto the trail at our half-way point; in fact, we would not have noticed it had we not stopped within a few feet from its head to take a photo. There it was, and so we took its photo too. 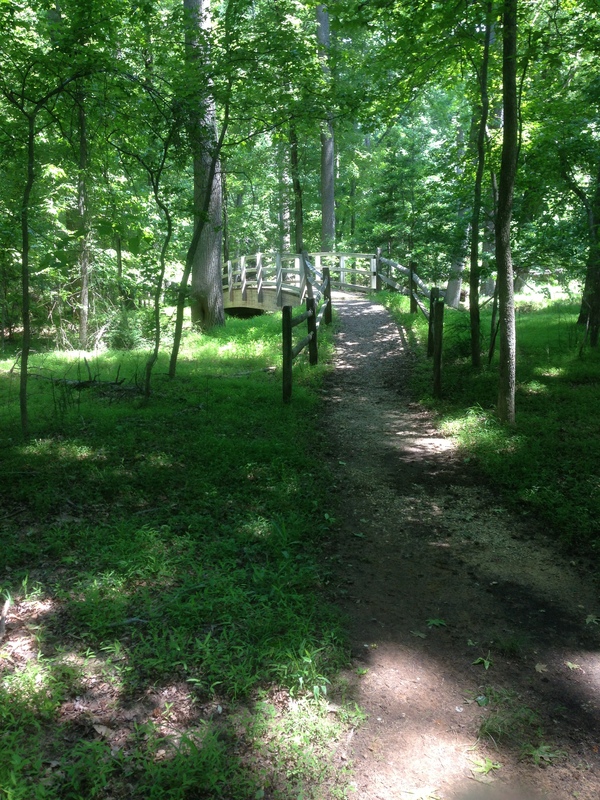 The Perimeter Trail offers an easy jaunt for families, but joggers appear to have all but claimed this path for themselves. A dozen passed us by. The path is well maintained. Short, two-person benches are placed at quarter-mile intervals, reminding one to break for moments along the way. Mileage markers also appear frequently. If one wishes to begin one’s trek at Mile 0.0, then begin where the trail is nearest to the park entrance. Park at the Sweetgum lot and walk across the park road to pick up the trail. You won’t need a map, but if you have one, it may ease your mind a bit when you come to places where the trail takes a turn at an intersection or crosses a road. Overall, though, the trail is easy enough to follow. Note: Dogs on leashes are permitted on this trail—but, beware of ticks! Karen and I both discovered ticks on ourselves after our hike. 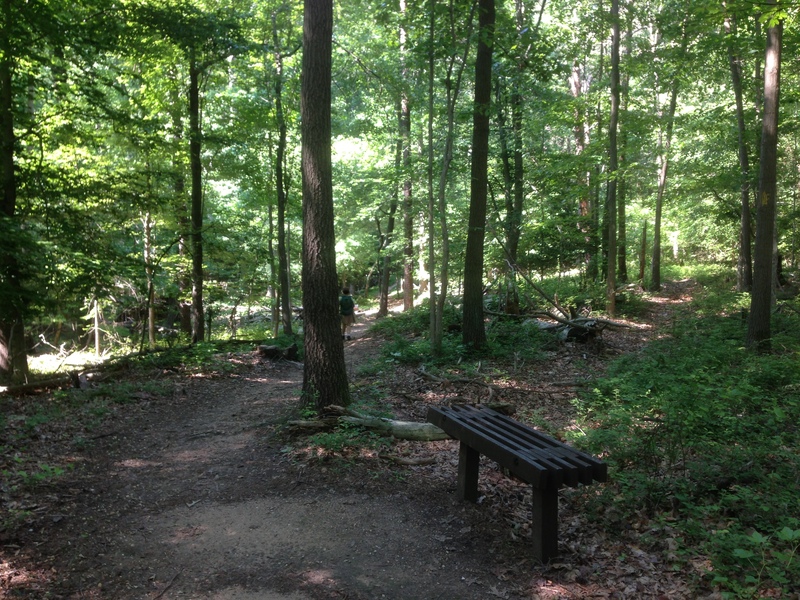 This entry was posted in Birch's Jots on Jaunts and tagged day hike; Greenbelt by Birch. Bookmark the permalink.